Our toughest tubular aluminum rear rack designed for heavy-duty, long distance touring. 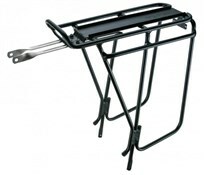 Integrated side bar gives a lower pannier attachment point– allowing more space for cargo on the rack top. QuickTrack™ compatible for use with any MTX TrunkBag, rear basket and pannier bag. Well made, easy to fit and robust. The extra lower hanging bars make it so much easier to carry a tent etc on the top of the rack. The only disappointment is that the pannier bag clamps have already worn away the black coating. So that doesn't seem to be very robust. This is a well made rack constructed of good materials and strong for its weight. 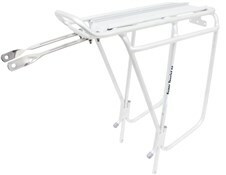 However, the nuts and bolts that are provided to attach the rack to the stays are, in true Topeak behaviour, made of rubbish metal that strip the threads very easily - even using an electric screwdriver on low-torque. Why compromise a great product with cheap ancilliary items. Solid rack with convenient topeak MTX track system. Was quick and easy to fit with all the right nuts and bolts. Looks good in silver as well as black. Same price as the ZEFAL one I purchased carrying capacity equal though slightly lighter in weight. The best part of it that it is compatible with MTX and RX system Topeak bag. as far as I know the Police use them too. Saves 5 mins assembly each time of usage.